This entry was posted in Geoff Collins, Temple football and tagged Geoff Collins, Isaiah Wright, Kevin Ross, Nick Sharga, Paul Palmer, Taver Johnson, Temple football. Bookmark the permalink. Gee, Collins is such an exaggerator: “Mayhem Mansion”, next years “Ridiculous” team, etc. I wonder if the players fall for all that stuff. He should be that “out there” when it comes to considering assistant coaches, huh? Why does he go for guys from all these directional, small programs? If you want to see a real killer attitude on defense, seek and destroy type of stuff, then give Mr. Ross a call. He wasnt about slogans, words or hashtags….he was about doing! With bad intentions and a toughness unequaled…thats what he’ll get out of his players. So will Nick Rapone….would love to play for both of them. Get Temple Tuff again! Exactly Brian. Instead of mayhem last year we got bm. (bowel movement for those unaware). I’m getting the feeling that we’re going to get more bm this season. I think we will be very lucky to float around the same 7-win range we had last season due to losing half of the key contributors from the AAC title team. (The other half we lost with P.J.’s class.) I would argue our juniors of the championship year were just as responsible for the hardware as our seniors that year and they were frightfully underused by the new staff or would have led the way to 9 wins this past season. Maybe Collins will prove me and K.J. wrong with his “unbeaten season” and “ridiculous team” predictions. I certainly hope so. I looked at this without my Cherry and White glasses on and do not see it. I cannot get past the fact that he used Sharga as a guitar playing prop in a puff piece for TV and that’s about it. Have questions been asked about the Sharga playing time? How could he keep him off the field and think of himself as a good decision maker? Am I missing something? When MR was here none of us would worry (truly worry) about the recruiting rankings because we knew Rhule got the kids he needed to put into his tough, no BS system. Now with the hashtag this and mayhem that, I don’t think we have a shot. Maybe I’ll eat my socks but I don’t think this guy fits into what Temple is, now or ever. Let’s hope not. Looking at the retweet on the this page of the PennLive/Dave Jones piece, don’t want to give the students a reason not to attend by having an uncompetitive team. Still don’t understand how all those 3 stars only add up to a #80 recruiting class. But whatever. Agree, with all those really good players gone the last 2 years, there needs to be a lot of stepping up to have a decent season. But who knows? It can because the rankings go out to four decimal places so one could be a low ranked 3 star or a high ranked 3 star. When averaged out, although all recruits are 3 star, the average may well be lower than another school that also had all 3 star recruits. I think the rankings are misleading for this reason and too subjective. It appears that rankings rise and fall based on which schools are recruiting a kid and which school ultimately signs him. 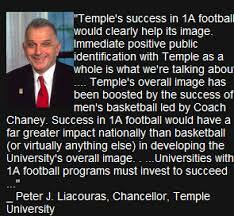 That’s why the coaching is so important….there have been plenty of teams with tons of talent but can’t seem to live up to the hype and conversely….the underdogs that can just play ball when it’s nut cutting time….get Temple Tuff again! Look at Temple with Hardin. He coached talent up. Bruce did for two of his five years. Al did for a while and Matt did his last two years. I would argue (convincingly, except to the Pravda apologists) that Geoff Collins did not his first season nor did Rhule for that matter. Surprisingly, even at 1-11, Golden outcoached his first-year talent. Before 2017, when was the last time TUFB red-shirted an entire class? never? where is the seed corn? what would you rather have, a Top 30/40/50 recruiting class, or a Top 80/90/100 recruiting class?